Colorful clouds appear near the Rho Ophiuchi Nebula in this photo. Astrophotographer Tom O'Donoghue took this image from Spain beginning in the summer o f 2011. He completed imaging in the summer of 2012 after a total of twenty five nights. Brilliant colors swirl and glow in the Rho Ophiuchi Nebula, as seen in this beautiful night sky image. Astrophotographer Tom O'Donoghue moved from Ireland to Spain to begin imaging this stunning nebula in the summer o f 2011. Twenty-five nights and two summers later, the image was completed. 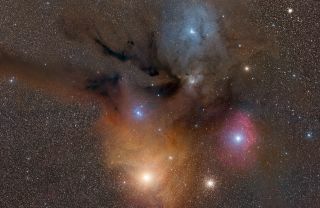 The night sky between the bright star Antares and the Rho Ophiuchi nebula looks so colorful because there are several types of gas and dust in the space between them. Gas clouds produce reddish emission nebulas, while glowing dust makes blue reflection nebulas. Rho Ophiuchi can be seen at the center of the blue nebula. Antares lights up the yellowish-red clouds on the lower half of the image. The star is a red supergiant and one of the brighter objects in the night sky. Globular cluster M4 and Sigma Scorpii can also be seen in the image. "It is such a beautiful part of the night sky, with bright colors from various types of nebulae shining in front of a myriad of Milky Way stars," O'Donoghue said. O'Donoghue used a Takahashi FSQ106N, ATK1100 CCD camera and Takahashi EM200 mount with a 60mm Takahashi refractor with an ATK16 CCD camera for guiding on top of the FSQ. He used Baader Hydrogen Alpha and LRGB filters, which are housed in a True-Technology filter wheel.